Call it the West Texas Two-Step—the crazy dance crude oil often breaks into after the release of the weekly EIA Petroleum Status Report. Yesterday was no exception. When the report hit at 10:30 a.m. 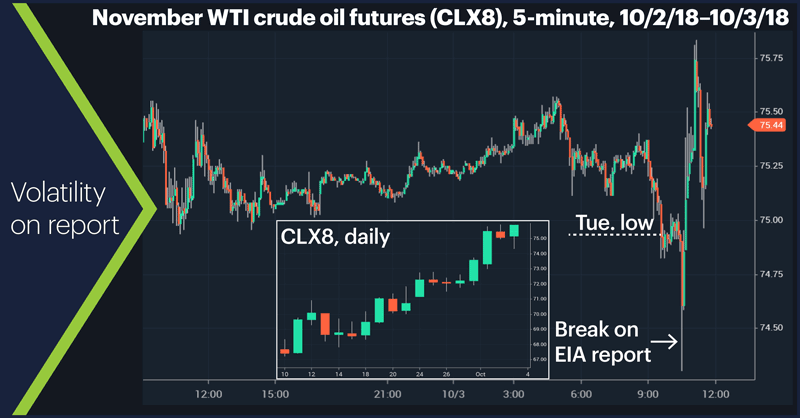 ET (revealing an eight million barrel increase in US crude inventories1), traders quickly slammed November WTI oil futures (CLX8) around 60 cents below Tuesday’s low, but almost as quickly pushed them a dollar higher and into the black for the day (five-minute chart, below). Then they dropped back into the red, rebounded again, and…you get the picture. Despite the initial plunge, though, the day’s action left oil pressing at four-year highs just two days after initially reaching resistance around $75.50 on Monday (and on the back of a 12% rally since September 10). Before the day was over, November crude almost hit $77. A lot of people—not just futures traders—are wondering how high crude can go, since there are plenty of energy stocks taking their cue from the direction of black gold. (The S&P 500 energy sector trails only information technology over the most recent five days.) Chart enthusiasts have likely noticed there’s very little in the way of technical resistance between here and crude’s pre-2014-collapse highs around $100. Markets don’t move just because of lines on a chart, though, and $100 is still a ways off. But if crude fails to retreat quickly from its current level—in the aftermath of a large inventory increase and news that Saudi Arabia had increased its output2—bulls could maintain their grip on oil, stops could get triggered, and energy stocks could experience some gushers of their own. Today won’t be the final word, though. 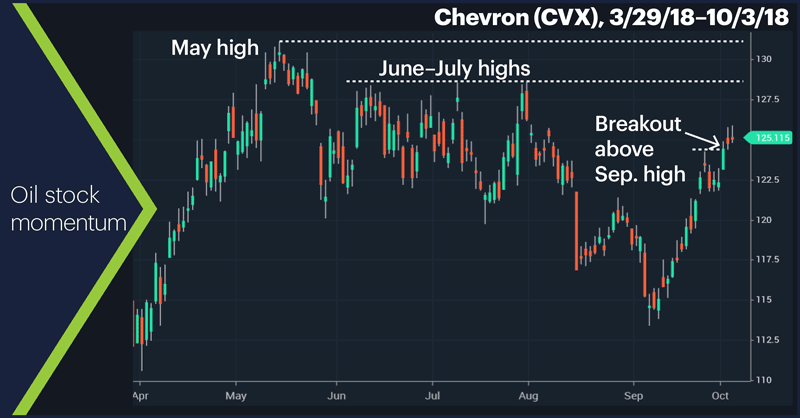 Not all of them are visible on the chart, but the stock’s September rally left CVX without any apparent chart barriers to its three nearest resistance levels: the June-July highs around $128.50, the May high around $131, and the January highs around $134. Now all crude has to do is follow through to the upside. Keep watching those oil rigs. Market Mover Update: The Dow Jones Industrial Average (DJIA) hit another record high yesterday, topping out less than 50 points shy of 27,000. After trading to a slightly lower low yesterday, Bottomline Technologies (EPAY) recovered some of its recent pullback by rallying nearly 2%. Brookfield Asset Management (BAM) continued to trade weakly after Monday’s record high. Today’s numbers (all times ET): Factory Orders (10:00). 1 Econoday.com. EIA Petroleum Status Report. 10/3/18. 2 Reuters. Oil slips below $85 as Saudi raises output towards record. 10/3/18. 3 Zack’s Equity Research. The Zacks Analyst Blog Highlights: Exxon Mobil, Chevron, Royal Dutch Shell, Petrobras and BP. 10/3/18.